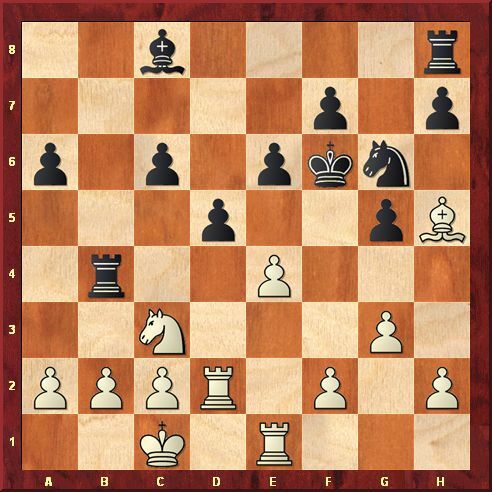 Levon Aronian's brilliant victory at the prestigious Tata Steel tournament in Wijk aan Zee, the Netherlands, would normally be the topic of our conversation. But it was a young Chinese girl, Hou Yifan, 17, who stole the limelight. The women's world champion shared first place at the powerful Tradewise Chess Festival in Gibraltar, one of the world's strongest open tournaments. Hou was in the lead going into the last round, but was caught at the last moment by Nigel Short. They both scored 8 points in 10 games and the English grandmaster grabbed the title in a blitz playoff. But Hou faced much tougher opponents. Against six grandmasters rated above 2700 points - a barrier reserved for the best 40 players in the world - she scored four wins and two draws, including a historic win against Judit Polgar, the all-time best woman. Aronian won Wijk aan Zee with a 9-4 score, a full point ahead of his rivals Magnus Carlsen and Teimour Radjabov, and added 14 points to his rating. He now trails the top-rated Carlsen only by 11 points. The next FIDE list will show the top four as Carlsen 2835 points, Aronian 2824 points, Vladimir Kramnik 2801 points, and the world champion Vishy Anand 2799 points. Carlsen seemed to be heavy-handed towards the end in Wijk aan Zee. His play was not smooth and his games personified hard long labor: he wanted to win, but his mind was tired. On the other hand, Aronian mixed up playfulness, lightness, elegance - his play looked fresh and cheerful. A good example is the final combination against the Dutch grandmaster Anish Giri, who came to Wijk aan Zee with an impressive victory in the traditional Italian tournament in Reggio Emilia. 42.Rxe1 Qf4+! (The queen sacrifice flows naturally from the last move.) 43.Kd1 (On 43.Nxf4 Rxe1 mates.) 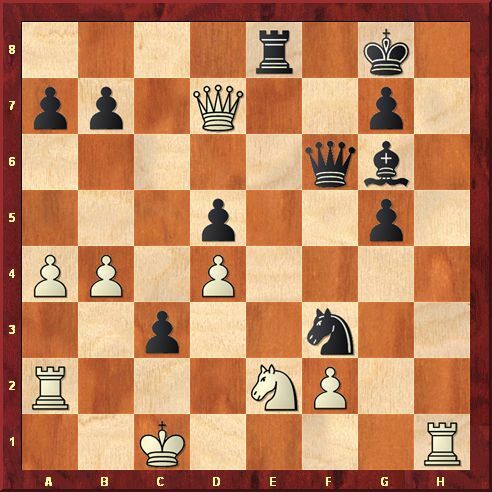 43...Qe4 (Threatening 44.a5 Qd3+ 45.Kc1 Qb1 mate. 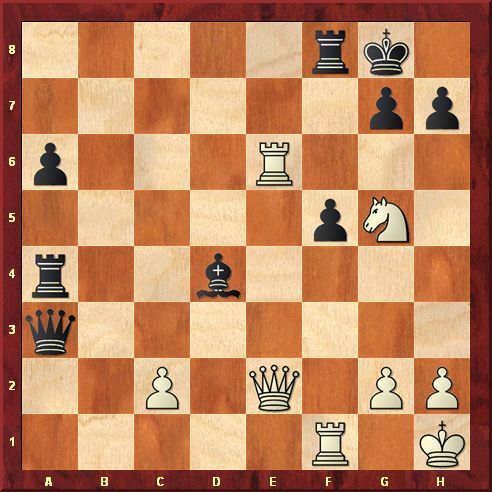 After 44.Qxe8+ 44...Bxe8 the game could finish with a smothered mate: 45.Nxc3 Qd3+ 46.Rd2 Bh5+ 47.Ne2 Qb1 mate.) White resigned. Aronian was in the news recently: he will play a friendly six-game classical chess match against Kramnik in April in Russia. He also announced that he is not going to play in the world championship qualification, the Candidates, if it is held in Azerbaijan. As Armenian, Aronian believes he would have a psychological disadvantage. When Hou Yifan won the women's world title in 2010 at the age of 16, she became the youngest world champion in history, male or female. As a twelve-year-old she dreamt of replacing Judit Polgar at the top one day. In Gibraltar, they faced each other for the first time. 48.f6+! Kxf6 49.Rxc8 Rxc8 50.Rxh6+ and wins. Judit didn't want to see any of it.) Black resigned. Throughout the tournament, Hou played like a pirate with no fear, attacking when the odds were against her, stealing chess pieces and points from opponents rated far above her. She survived opening clashes and finessed the endgames. She gambled against the Vietnamese ace, Le Quang Liem, sacrificing pawns and it paid off. It was the second game where she took advantage of the move h7-h6. White threatens to win immediately with 34.Qh5 and the mating attack comes through. 33...h6 34.Rxh6! (A shocking rook sacrifice, leaving the black king vulnerable.) 34...gxh6 35.Qe6+ Kg7 36.Qd7+ Kg6 37.Ne6!? (Playing for a win without risk. Hou could have secured a draw by perpetual check: 37.Qe6+ Kxg5 38.h4+ Kh5 39.Rxf5+ Rxf5 40.Qxf5+ Kxh4 41.Qf4+ Kh5 42.Qf5+; or 37...Rf6 38.Qg8+ Kh5 39.Ne4 fxe4 40.Qd5+ Kg6 41.Qg8+; or 37...Kg7 38.Qd7+ Kg6 39.Qe6+.) 37...Bc5? (Being under pressure, Le finally slips, missing the only defense: 37...Rf7! 38.Nf4+ Kg7 39.Nh5+ Kg8 40.Qe8+ Rf8 41.Qg6+ Kh8 42.Qxh6+ Kg8 43.Qg6+ and Hou has to take a draw since no winning continuation is in sight.) 38.Qg7+! Kh5 39.Nxf8 (The black king is in a mating net and cannot escape.) 39...Bxf8 40.Qf7+ (40.Rxf5+ Kh4 41.Qf6+ Kg4 42.Qg6+ Kh4 43.Rh5 mate was faster. 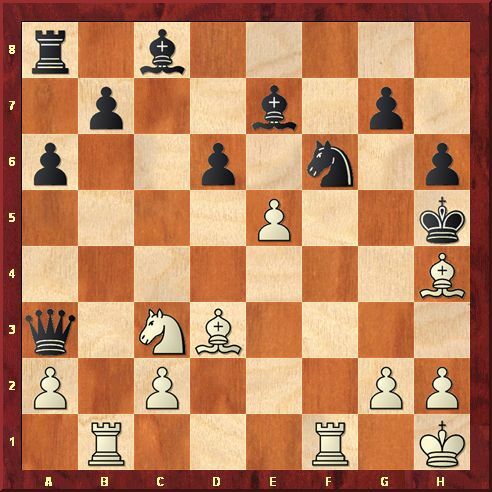 Black gets mated anyway: 40.Qf7+ Kh4 41.Qf6+ Kg4 42.Qg6+ Kh4 43.g3+ Kh3 44.Qh5+ Rh4 45.Qxh4 mate.) Black resigned. The king's hunt resembled the last round grandmaster game between Emanuel Berg of Sweden and Maxime Vachier-Lagrave of France. Both black kings were hunted down to the square h5. 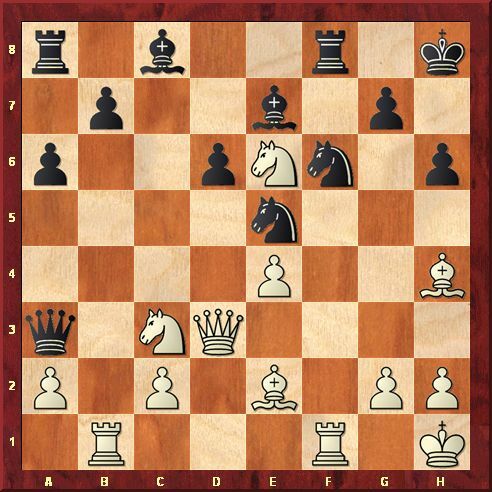 Berg's game is also important for the theory of the Delayed Poison Pawn variation in the Najdorf Sicilian. 21.exf6 Bxf6 (The alternative line 21...Qxc3 22.fxe7 Bd7 23.Be1 Qe5 24.Rxb7 Qxe7 loses after 25.g4+ Kxg4 26.Rg1+ Kf4 27.Rb4+ Ke5 28.Re4+.) 22.Bxf6 gxf6 23.Rb3 (White already had a choice. He could have also played 23.Nd5 f5 24.Nb6 Rb8 25.Nxc8 Rxc8 26.Rxf5+ Kh4 27.Rbf1 and mate soon.) 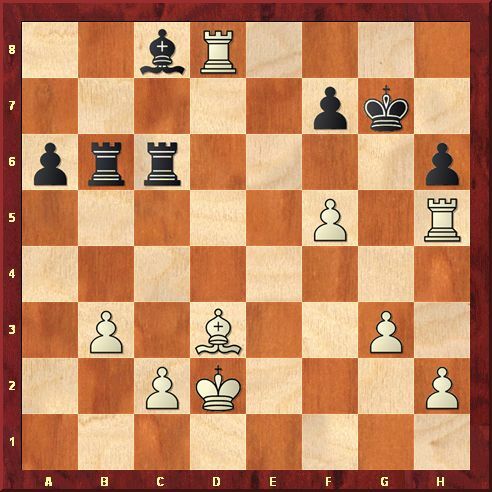 23...Qa5 24.Rxf6 Bd7 25.Ne4 Bg4 (After 25...Qe1+ 26.Rf1 Qa5 27.Rxb7 wins, for example 27...Bc6 28.Be2+ Kg6 29.Rf6 mate.) 26.h3 Rg8 27.hxg4+ Rxg4 28.Be2 Qe1+ 29.Kh2 (After 29...Qxe2 30.Rh3+ Rh4 31.Rxh4+ Kxh4 32.Rf4+ Kh5 33.Ng3+ wins.) Black resigned. Note that in the replay windows below you can click either on the arrows under the diagram or on the notation to follow the game. Image by Zeljka Malobabic © Tradewise Insurance Ltd.